There isn't enough neon on the surface of Jupiter. This rather prosaic fact might point to one of the most spectacular sights in the solar system. Inside Jupiter, it might rain neon streaks. Jupiter is a disappointed sun. It is a massive cloud of gas that gets denser and denser towards the center, but never condenses to the point at which its center elements start fusing together. It's not big enough. It's still fairly big, though, and comprises many different kinds of elements at many different levels. The Galileo probe mission found, recently, that at its surface - or rather at the top of the clouds farthest from the planets center - there is a dearth of neon. As a headline it's not electrifying, but it's a fact that does require an explanation, and scientists set to work. They came up with an interesting explanation. As gases sink down inside Jupiter they become more and more compressed. Compress a gas enough, and it will turn to liquid. 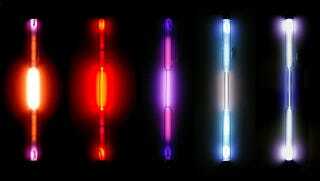 Three gases - neon, helium, and hydrogen - at a certain depth, act as metallic liquids. They don't all act that way at the same depth. Hydrogen goes metallic first, which means that it no longer mixes with neon and helium. Helium, being more dense, continues sinking through the gas towards the center. It doesn't go alone. Neon dissolves easily in helium, and the helium takes the neon along for the ride, sinking down, away from the surface, past the hydrogen, and towards the center. We know what neon does when it gets heated up and excited. Since the helium and neon will be moving through other elements, jostling and bumping, as well as being increasingly compressed, someone looking up (from one hell of a well-designed ship) might be able to see streaks of bright neon rain lighting up the depths of Jupiter as it falls down. Via The Disappearing Spoon, Sequestration of Noble Gases in Giant Planet Interiors, Space.com.